For over 70 years, Van-Packer Co. has been at the forefront of venting solutions for HVAC applications. From stainless steel vents, free-standing stacks, and to refractory-lined venting systems you can be assured that a Van-Packer Stack will meet all requirements of the job. 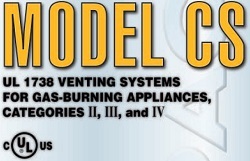 Model CS may be used for Category II, III, and IV applications where the appliance is natural gas or propane fired, flue temperatures are 550° F or less, and the vent pressure will not exceed 5 inches of water column.